The Astar is a beautiful example of a wood-driven designer whisky. It is made from 'slow growth, air seasoned, heavily toasted, lightly charred, ex-bourbon American oak barrels'. It doesn't have an age statement but is in the 9-10 year range. It certainly has more character than the standard 10 - thanks both in part to higher ABV and the careful selection of very good oak. Apparently newer 10 year olds have a lot of this Aster type liquid in it to give it that extra edge. So that should be something interesting to look forward to. And if you prefer your Glenmorangie without any fancy wine finishes then this dram is the one for you. Nose: Immediate lemon sharpness softened by warm butterscotch hard-boiled sweets. Lots of honey vanilla on fruit cake with a sprinkle of almonds. It's quite a sweet treat as the fig and raisin trifle comes through quite strongly as well. Palate: Raisin sweet at first and then the white spices. Honey with lots of fruits; mainly papaya. Nuts. And freshly baked Danish butter biscuits. Finish: Long with tropical fruit spiciness to it. This is a gorgeous dram and sits well among it's peers in the Private Edition series. @MaltActivist , I still think you're in the majority, in terms of having decent bottles. Mine is a 70cl bottle, probably 2012. I'm suspecting that the 1L (travel retail) bottles and the 750ml bottles (US) may be different, but it's just a guess. I would also guess the travel retail bottles are older (before 2012), because I think they have not been marketed there for a few years. But it is frustrating to experience the downside of batch variation... I remember seeing it in the Top 50 of this website (even top 25?) a few years ago, and so developed high hopes. @FMichael , I had read somewhere that Glenmorangie has been modifying the 10yr Original by gradually integrating Astar manufacturing methods. So it could be that the Original has just become better-- and so the Astar seems less substantial in comparison? It's nice to see that some enjoy the Astar for I was one that did not...I found it nothing more than a 'mouth burner' with little flavor...I needed to add water, and when I did - all I got was the Glenmorangie 10 yr Original. Nose: Vanilla cream, quickly joined by sharp lemon zest. The sharpness transforms to chilling menthol eucalyptus. If I really search, there is a weak fruit between dry bartlett pear and coconut, with powders of cinnamon and ginger. But mostly the cooling eucalyptus seems to endure. Palate: Enters soapy mint over white pear, with a tangy punch. From this there builds feisty ginger with pleasant toffee sweetness. After the peak, these become white pepper and sharp almond. There is a lingering burn of red-hot cinnamon. Finish: The burn eventually cools to dry menthol-anise on underripe pear. A minute later, there is raw cashew and a faint echo of coconut. Palate: Smooth caramel entrance. Eucalyptus coolness soon grows, and then bites like zest or pine. This becomes light ginger as caramel sweetly returns (which is the the best part). Nutty almond rises from the caramel, before menthol revisits for the finish. Finish: Long cool anise and lemon zest, unripe pineapple and drying oak of vanilla & almond. The Astar is, quite frankly, the first time that Connosr has let me down. I had gained expectations for a creamy and rich lemon-pineapple-coconut-honey treat; instead I find myself with an unbalanced malt that has far too much prickly eucalyptus (for my preferences). While I can enjoy this kind of menthol influence in certain bourbons and ryes, those usually have deeper flavors to compensate (e.g. brown sugar, banana). The Astar, however, is all light (lemon, pine), so it is altogether top-heavy. Purely "refreshing" flavors are welcome in my mouthwash but not in my scotch! The main attribute holding it together is the nutty caramel that appears midpalate. I cannot compare this to anything else I have had, due to the above. If someone enjoyed this for the menthol, I would rather direct them to certain bourbons or ryes. If someone enjoyed it for the other light flavors, I would rather direct to something like the Arran Original or Mackmyra Brukswhisky. And I would unhesitatingly direct anyone to Glenmorangie's more recent Private Edition malt, the Ealanta, which also provides fruit and lightness, but with more cream and without the cool burn. Thanks @Tandem -- I can't ask for better affirmation than that! And thanks for adding; I might have lumped those smells in with the vanilla. Since writing this review, I have noticed that @SquidgyAsh mentioned, a couple times on this website (in different places), that he experienced a worse-- and also "soapy"-- batch of the Astar. So it is possible we just got duds. I am still keeping some distant hope that all the menthol-y stuff in my bottle will magically evaporate, so that after several months I will end up with the lemon-cream delight others have talked about. It's not completely absurd: @Victor 's review of Glenmorangie's Quinta Ruban recommends leaving it about 1 year after opening, to take it from very imbalanced to quite coherent. I had to come back to this to check when I had wrote my comment on the Astar. As it seems I opened the bottle about 7 months ago and for the first time in maybe 2 months, I poured again a dram. The bottle has about three quarters left still. I have to say this whisky has transformed! And I'm glad I had the patience to wait and let it settle. It still definitely needs a lot of water, but after 5 teaspoons or so, I'm finally getting the lovely lemon custard note. Nuts, maltyness, freshness, it's all there. And the pungent eucalyptus that controlled the whole scene originally, it's next to gone. My rating would now climb from high seveties to high eighties at least. Legs: moderate, to be expected for a young whisky. Nose: Needs 15 minutes in the glass. After that, hints of vanilla nougat surface with a little oak. After 25 minutes: strong pear/bourbon influence comes through and mingles with the rest. Taste: Heavy alcohol tang (not in a good way); pronounced pear and bourbon; La Florentine Torrone; bitter oak (unpleasant). Finish: malt; bitter oak; a hint of honey. Comments: This dram was a disappointment, clearly. I will not be buying a bottle of the Astar, after all. Considering how thoughtfully Glenmorangie bought a stand of oak trees in the US, leased out the new barrels to a US bourbon distiller, and then used them for this whisky, I would call all of the effort pointless for such a young whisky. It is lost due to the young brash nature of this bottle. Too bad. A teaspoon of water improved my dram. All of the talk about "creamy" this and "tropical" that simply was not in the glass for me. Nose: pineapple, clementines, and cherries. White chocolate. Honey drizzled in Greek yogurt. Champagne. Palate: pow! This one's a punch in the mouth in the best possible sense. Like sucking on Fireball candies, followed by chocolates, followed by fruit and honey and vanilla and caramel and oatmeal, and I don't know what else, but I like it. Finish: a smooth and lingering, sweet, spicy burn. This gives the Nectar D'or a serious run for its money, and I think the cask strength ABV gives it the slight edge. Glenmorangie knows their wood. I originally rated this a 91. Given time with it, however, I find the cask strength ABV actually detracts a bit from the flavor enjoyment. Some cask strengths are absolutely perfect (the A'bunadh, for instance), but in this case, the alcohol slightly overpowers the taste. Where I initially preferred this to the Nectar D'or, I've now found I much prefer the D'or as my standby Glenmorangie. Don't get me wrong, the Astar is fantastic and highly recommended to those who generally prefer cask strength spirits, but I had to knock it down below the D'or in my ratings. I honestly was indifferent to this whisky; I've had better cask strength that have alot more to offer than remove the lining of my mouth as this Astar had done. IMHO the Nectar D'or is much better. The flavors in Glenmorangie Astar are light, but they are here in abundance, all well-preserved and articulated in their cask-strength glory. Think of a light, sweet Highlander pumped up on a Barry Bonds supply of steroids, and you’ll get the idea. Nose, neat: Blasts of malt, vanilla, citrus, honey, nuts, pepper, cinnamon, and white wine. A surprising absence of booze burn for a 57% ABV whisky. I don’t get the floral notes that one associates with Glenmorangie, but I do get a slight trace of dust from time to time. Not enough to detract from the overall quality of the nose, however. Taste, neat: As with most cask-strengthers, I take just a teeny sip neat, mainly to get an idea as to how much water to add. A good mouthful usually results in little more than burn and hiccups. This is surprisingly gentle on the arrival, with peppery spices dominating, but the flames start the longer you hold it in your mouth. Nose: I don’t notice any new elements, although it’s cleaned up a bit (no more dust). It may have lost some heaviness, but it’s also become more crisp and articulate. Taste: Now we’re into previously uncharted territory, with a long list of unanticipated flavors: apples, pears, cake frosting, butter, ginger, lemon, plus the aforementioned vanilla, honey, and nuts. The malt elements have virtually disappeared, but that’s not necessarily a bad thing. The finish is dry and a bit strange, in that the warmth lasts long, but the flavors run away rather quickly. Nevertheless, there’s too much going on in my mouth to complain. It’s a unique whisky, to be sure. The flavors may be familiar, but their abundance, and the juxtaposition of so many contrasts, is one-of-a-kind. If you like a whisky worthy of thoughtful consideration, this is for you. But it’s also highly recommended for those who just like to drink and enjoy. Great review! This only cements my desire to get a sample of this sometime soon. Cheers! So when we had last left our intrepid heroes they had finally managed to get to the whisky bar Helvetica after months of being delayed due to sickness, public holidays, work conflicts and an emergency appendicitis. So far in our story our heroes (my wife, myself, my brother and sister in laws) have finally met up and the whiskies that have been tried so far were Glenfarclas 12 yr old, Yamazaki 12 yr old, Hakushu 12 yr old, Glenmorangie Nectar D'or and Amrut Fusion. Next to be sampled! I'd enjoyed the Nectar D'or, but thought that it should have been stronger to get the full pleasure from it. My sister and brother in laws ask me for some recommendations while I order the Glenmorangie Astar, I suggest the Hakushu 12 yr old for my brother in law as he enjoys some smoke and the Balvenie 21 yr old Portwood for my sister in law. However when my sister in law sees the price on a shot of the Balvenie (34 dollars a shot) she goes a little wide eyed. I then suggest the Aberlour A'bunadh (19 dollars). We order our drinks and my brother in law promptly exclaims that he enjoys the Hakushu immensely. My sister in law takes a sip of the A'bunadh as I tell her that she might want to add some water in it and promptly gasps. She then says she doesn't care for it. I again suggest that she add some water and see what that does. She does, but mainly leaves the Aberlour untouched. My turn finally: Glenmorangie Astar!! I finally get to nose the Astar and I'm blown away. It's like a desert in my nose. There's custard, vanilla, cinnamon, and lots and lots of fruit. My wife takes a nose and comes out with the same experience. This whisky smells heavenly. I can't wait to taste it, however my wife will not be joining me for a taste as she needs a break. I bring the glass to my lips and gasp in pleasure. The flavors feel my mouth to the point that the whisky feels solid across my palate. The flavors: Lots and lots of fruit once again, apples, pears, oranges with lots of honey and vanilla, some cinnamon. This is my new go to summer whisky! The finish is long with the sweetness flowing through to the end. This is an awesome whisky! My in laws each take a sip and say they enjoy it quite a bit. I didn't cut this one with water, even though it was a much higher proof then the other whiskies as it didn't feel like it was needed. Very very enjoyable. I need to pick up a bottle of this stuff, so much so that I asked my brother to buy me a bottle for my birthday. And at around $90 AUS a bottle it's a steal of a deal!! @SquidgyAsh, who knows how you will feel about Glenmorangie Astar or any other whisky the next time you try it? That's why you try it again, right? Along with maybe hoping for some of the same sort of enjoyment you remembered from the first time. It is always good to do several tastings of a whisky to put it into perspective. I take my first taste of a whisky seriously, but it is always necessary to keep an open mind and revise one's overall appraisal based on the cumulative experience of repeated tastings. Sometimes the picture becomes very complex with a number of tastings of the same whisky, as our batch variation comments and discussions have brought out. I have a lot of sympathy for someone like Jim Murray, attempting to comment on 4,500 whiskies and make sense of them. Clearly, simplifications for practicality have to be made to do so, like his practice of only sampling and evaluating the whiskies neat. There would be no room in the book and no time in the year to put out his Whisky Bible if most, much less all, of the subtleties and complexities were engaged in print. I love that Mr. Murray keeps in his book very different discriptions and very different ratings of the same whisky, reflecting very different experiences of it from one tasting to the next. 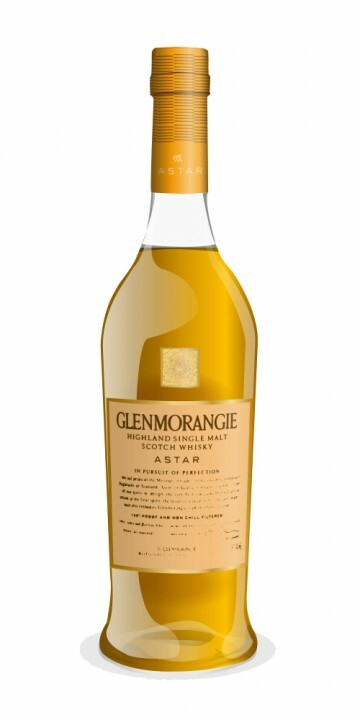 First Glenmorangie stopped making the Artisan Cask and replaced it with the Astar. Now they've stopped making the Astar. Wonder what will replace the Astar, if anything? I have a few bottles of the Astar stashed away, at reasonable prices. It's £83.59 ex VAT at the Whiskey Exchange and that doesn't include shipping. Found a few bottles in the NH (USA) state liquor stores and had my niece get some for me. Like Victor, my first taste of the Astar did not impress, but I now find the Astar a very likeable Scotch. I'd put it in the high 80's, as Greg did. Nose: Dessert, custard, cream, apple pie, spices (vinilla and cinnamon), white chocolate, sweet grains. Palate: creme-brûlée, sweet, creamy, vinilla custard, ripe pears and pineapple, rich honeys. Finish: Honey, apple crumble with cream, custard, tropical fruit, a pinch of mint, finishes spirity. I did get the distinct image of a creme-brûlée when drinking this. Great whisky. Also note it has some spirity fire from its sizeable alcohol content. The Astar is one of the few Glenmos that are bottled at cask strength. It is a vatting of so-called designer casks, from the Ozark Mountains. Astar is Gaelic for ‘the Journey’, referring to Dr Lumsden’s seach for these casks. They were are-dried for two years, heavily toasted, but only slightly charred. Despite the fact that there is no age statement on the bottle, insiders tell us it is around 10 years old. Anyway, enough lecturing, let us taste. The nose is extremely sweet with a truckload of vanilla, lemon curd and light spices à la nutmeg and ginger. After a little while, I get some chocolate. Very fresh, but rather simple. There is a good attack, thanks to the new oak, with white pepper and nutmeg. The aromas from the nose return, but are upholstered with Mirabelle (the very sweet, light orange prunes with shiny skin) and pears. A touch of caramel and coconut, too. Good body. Remains very sweet throughout. The finish is rather long, but very dry. The fruit ebbs away and the wood takes its place. This is, despite the simplicity, one of Glenmo’s finest. It has punch, which many of the standard Glenmorangie range lack a bit. About 60 EUR. Yes, and I can tell you this is my most favourite Glenmorangie what I ever tasted yet. What Glenmorangie said that this dram have infleunces of crème brulee, it is. The nose tells me that there are a lot of spices, deep dark warm sweetness of roasted caramel and crème brulee. The taste is for me a bit strong but the tastefull sweetness comes fullbodied over. Tastes like vanilla, fruity as peach and orange, sugary and some citrus notes after. The finish is long but very complex, honey, menthol and anise like at the end. For me is this a good after dinner whisky, like a 'Luxury Golden Fluid dessert'. I really recommend highly to any one, to try this fantastic dram. Especially for the people who love sweetness. It is a 'Private Edition' of Glenmorangie, so I hope that there are some available. It is rare and hard to find a bottle. I'm glad that I have one. I can sit more than a metre away from the glass and still smell this. Fruity, smooth and toffee sweet with a hint of spice - one of the best 'noses' I've come across in my admittedly limited experience. The taste is creamy and fruity with an underlying vanilla/toffee sweetness. Really big flavour, but still silky smooth and easy to sip. Very long aftertaste, again fruity and sweet. Fairly complex, meaning that every sip means you end up concentrating on some slightly different aspect, so every taste is different, but all of them are good. A personal favourite, and in my opinion probably the best value single malt that I have ever come across. @drinix - It's better than the Original, better than the Nectar D'or, much better than the Quinta Rubin. It bats in the same league as the Signet (haven't gotten around to the Sonnalta PX yest). This is the best value single malt I have ever had the pleasure of making the acquaintance of. At $100 Australian it is fantastic value, and I mean ~fantastic~! There are only a small handful of drams I would rate better than this, and all of those carry a much higher price tag. Recommend, recommend, recommend! @drinix This is one of my early reviews, and I wish I could edit to add a bit more oomph and emphasise just how much I enjoyed this one! You certainly won't regret getting ahold of this one, it is brilliant!